In my data recovery post I mentioned that the fastest way to boost your Technorati authority and get high ranking inbound links is to find blogs that have high PR and low Top Commentators and comment regularly on their site. 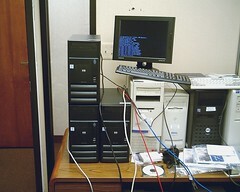 In 2005, results from a survey conducted by Opinion Research Corporations’ CARAVAN poll indicated that roughly 76 percent of adults in the United States own personal computers. On a related note, the U.S. Census Bureau estimated the July 2011 population to be 311,591,917. That’s a lot of computers in American households. Most people depend on computers for email, ecommerce, video, social networking, news, and other general information. Computers are a place to store important files such as documents, videos, and pictures and increase in this importance as a number of services and products go digital. Buzzwords. We all hear them. Often times, they exclaim the name of some new technological advancement. The term “web commerce” takes two basic terms and defines a new meaning. So, what is web commerce? The definition is simple. It is a form of commerce that occurs electronically that is usually carried out through the World Wide Web. Sending email and using other means of the internet can also function as a method of web commerce. It has become a fairly basic, common means by which companies can display their products, along with information and pricing. It is incredibly convenient and most of us use it in everyday life.